Go online looking for something new to rock out to, and feel in the mood for the weight of some alternative rock or the edginess of some punk. Well, trends in the music world are constantly changing and to some, nowadays it seems like the majority of what rises to the surface of mainstream public visibility for this little genre search is leaning more in a synthesizer, and electronically propelled direction, as opposed to one powered by the a good old dance of lead and rhythm guitar lines. The classic rock band foundation feels less common at present and there’s an ongoing pressure to go with the flow of how everyone else sounds, just so whatever a new band writes (especially if placing itself in that vein) can be heard. New Jersey rock quartet, The Nectars, show themselves to have a good grasp what it means to jump into the business of being a full time band – stylistic pressure, business trends and all – but the neophyte group has no trepidations about staying outside the lines of “what’s in.” Less than a year into their lives together as a band, The Nectars’ new single, “I Want It” is a perfect sonic demonstration of just how carefree from rock trends this group intends to stay. This is the second single off the group’s forthcoming debut full length, Sci-Fi Television, (following lead single, “Heaven” released in early December 2017) which is due for independent release on 25 May 2018. The track is conceptually messy. The dynamic direction is set to loud and never lets go. The imperative mantra of lead vocalist Jessica Kenny, is a splash of cold water to the face of traditional expectations in a heterosexual sexual encounter. This over-too-soon rock track carries the tools of old school rock but the attitude and social bucking of old school punk. Still, despite being a punk popular length of only 1:48, The Nectars don’t go off to the races in the tempo department like one might expect as compensation for the minimal length. The song has, and maintains, a steady, defined downbeat amidst an ascending, five note, primary rhythm line. This melodically minimal rhythmic rudder bounces between the thump of Montalbano’s kick drum, the crash of the cymbals, the one-note harmonizing subdivided line played by subtle but detectable keys, and a mirrored toss of the five notes back and forth between Paul’s bass and Baron’s guitar. Everything sounds a bit complicated and like it is all destined for a densely boring execution yet, that couldn’t be further from what the whole song actually inspires. The easy to follow backbone of the song provides plenty of support beneath Kenny’s pleading voice, which sounds – depending on the moment – either coy and innocently interested (You’re telling me to wait / I don’t wanna wait) or, unwaveringly, intensely lustful; even forming a drop of snarl on the ends of words and emphasizing the swelling sense of urgency (I want you nowhere else / I want you here with me). One could argue the dichotomy between the more static instrumental parts and the wider ranged movement of Kenny’s vocal part, reflects the simultaneous wildly fluctuating thoughts and emotions one can have in the heat of the moment, with the quickening but nonetheless consistent pulsing of one’s heartbeat as desire or aversion grows. The Nectars clearly sway with confidence between straight rock, an alternative spin, and the stand out brashness of punk but there’s no need to hammer the band down into one or more of the three before Sci-Fi Television even arrives. The core takeaway from these Jersey up-and-comers is that the four of them have a sonic vision of what they want to be and are in no hurry to change or conform from this beginning, even though the mainstream waters have already started rising outside their door. 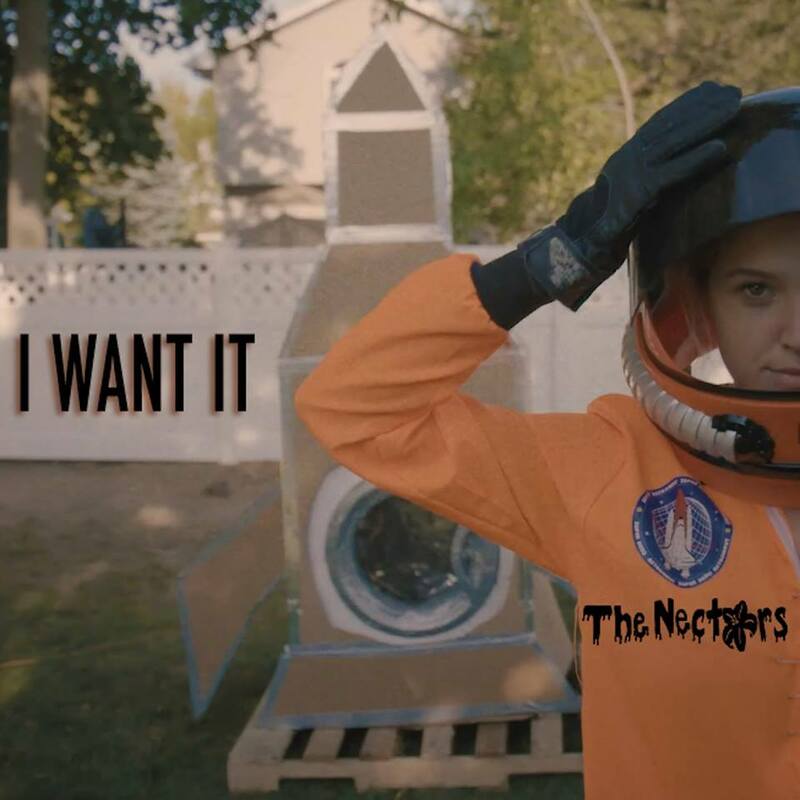 This entire vibe of how The Nectars are approaching not only this single but their first release as a whole, even in the face of accelerating awareness for such a young act, only intensifies the sincerity behind the band’s classic sound and adds to the number of less common reminders that going with the trendy flow is tempting but not mandatory to be widely seen, heard, or most importantly, enjoyed. “I Want It” is out now. Find the song through iTunes and streaming on Spotify and SoundCloud.